You are currently browsing the tag archive for the ‘blue and white’ tag. I hope you enjoyed the thrilling rise of the Hongwu Emperor as related in yesterday’s post. In accordance with the wishes of the editors who commissioned it, I left out the truly important parts—namely, how the Hongwu Emperor organized the Ming dynasty around Confucianist precepts, cunning agrarian reform, and above all—naked absolutism. I also left out the terrible end of Zhu Yuanzhe’s story arc: for the skills and guile which allowed the Hongwu Emperor to seize absolute power had a terrible shadow side. As an old man, he was seized by dreadful paranoia and employed vast armies of secret police, informers, and torturers to root out the imaginary plots which flowered on all sides of him. Hongwu killed hundreds of thousands of people by means of the most inventive and horrible tortures. Despite his astonishing feats, and despite the prosperity he brought to China, his name is permanently blackened by the depths of his cruelty (although Mao admired him). It almost makes you wonder if leaders aren’t inherently flawed somehow: as though there is some fundamental problem with putting self-interested individuals in charge of our collective destiny. 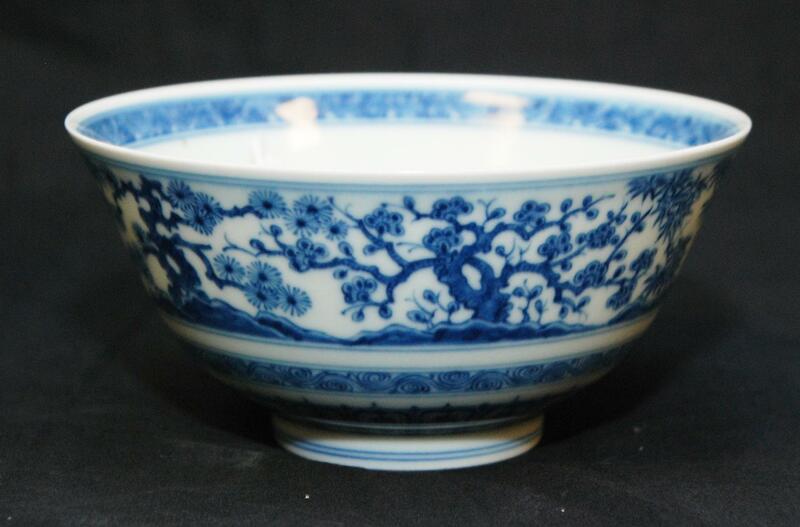 But today’s post is not about leadership; it is about beautiful & delicate Chinese porcelain! 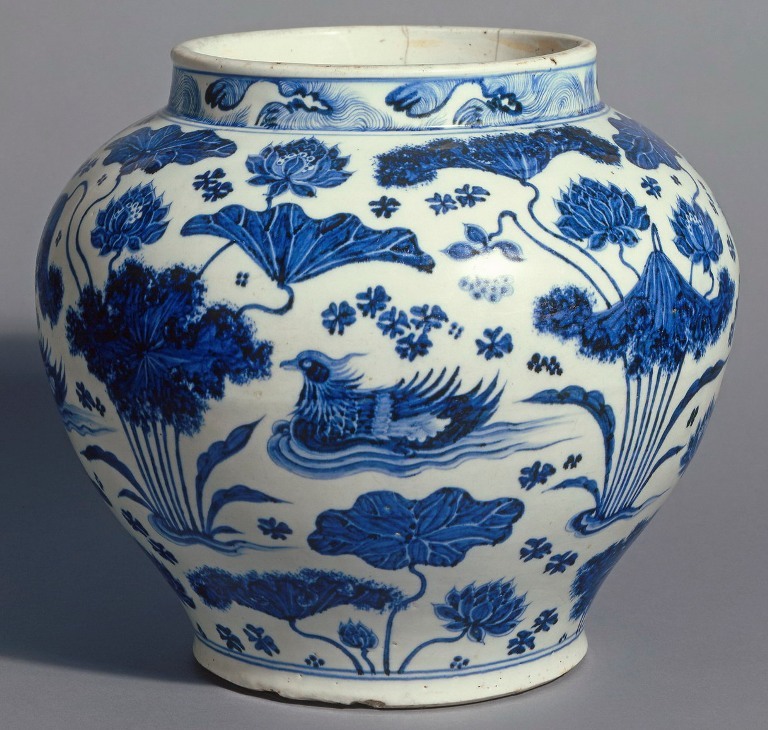 It would be unthinkable to have a Ming Week which didn’t feature a fine Ming vase. Here is a Ming dynasty vessel from the Jiajing reign (1522-1566). The Jiajing emperor was a weakling and a fool who devoutly believed in all sorts of portent, rituals, astrology, and mystical claptrap. His courtiers and eunuchs used this to control him while they robbed the Empire to the brink of disaster. Infrastructure was neglected. Crooked courtiers ground the peasants down into crippling destitution. The social fabric unwound. But what did the rich and powerful care when they lived in an era of such luxury? Porcelain of the Jiajing reign is particularly whimsical and otherworldly. This vase shows the “three friends” pine, bamboo, and plum growing together as emblems of wealth, happiness, and longevity. Each plant is twisted into an otherworldly logogram–a “shou” symbol. Here the plum blossoms forth out of a splendid stylized rock covered in lichen. Look at the decorative elements! The waves, the scrolls, and the mystical vegetation which surround the three central plants all began as naturalistic forms—but by the time of the Jiajing era they have been transmuted into ethereal blue beauty. And yet the original forms are still there as well. It is hard to describe what gives this little ovoid vase its winsome charm, but the aesthetic effect is undeniable. It’s been a while since we had any posts about how beautiful trees are. 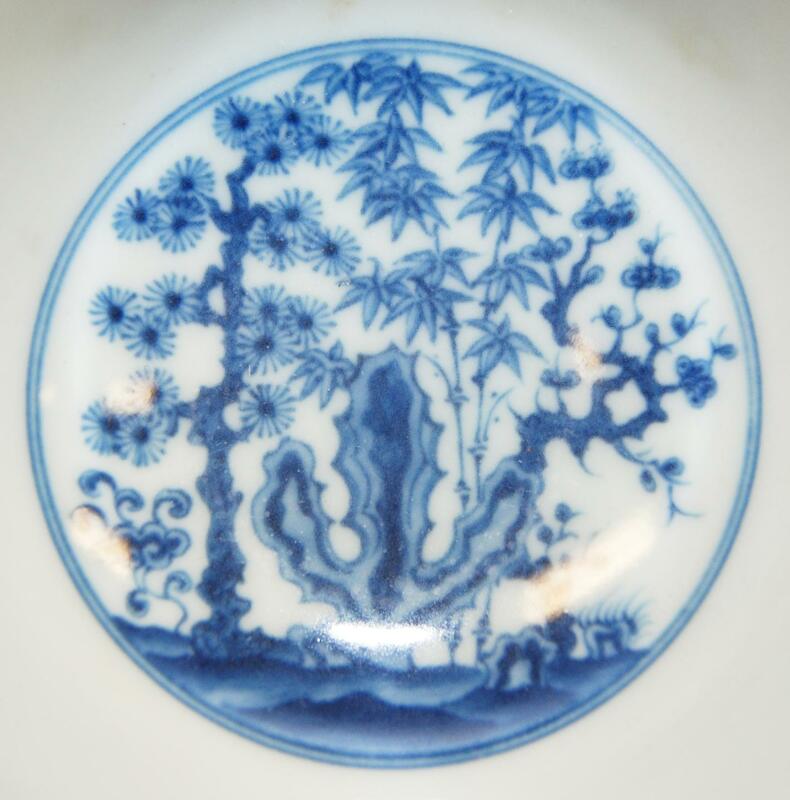 Therefore here are two Ming Dynasty bowls which feature tree art. The first bowl above is rather large and dates back to the reign of the Jiajing emperor (which lasted from 1521 AD to 1567 AD). The Jiajing emperor was a noted loon who believed absolutely in magical portents and auspicious signs—which in turn made him a pawn to corrupt court officials who used the monarch’s credulity as an opportunity to steal and/or ruin everything. However the emperor’s obsession with magic meant that Jiajing-era porcelain was marked by a beautiful sense of occult whimsy and Taoist fantasy. This bowl shows four different potted plants: a cypress, a pine, a peach, and a bamboo which are growing in a beautiful garden filled with butterflies, cicadas, and dragonflies. The plants are shaped in the form of four different auspicious words fu, shou, kang, and ning (happiness, long life, health, and composure). The second bowl is smaller and arguably finer. It also shows a garden scene bounded beneath by two ornamental borders of extreme elegance and beauty. A dwarf flower tree is bursting into blossom among spring foliage (the opposite side of the bowl shows a bamboo grove). Inside the bowl is a beautiful miniature garden of rocks, bamboo, and flowering trees. 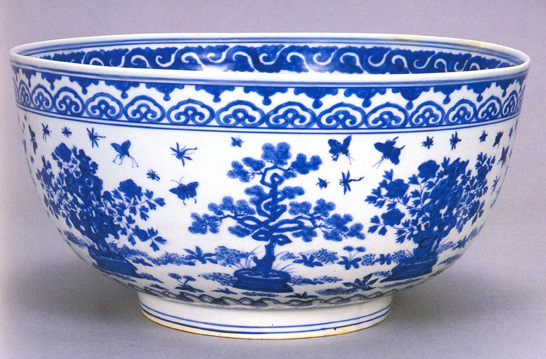 The tiny bowl was manufactured during the Chenghua reign (from between 1464 AD and 1487 AD) which was a troubled era of court intrigues and palace murders (which took place at the orders of the villainous concubine, Lady Wan). This little bowl, however, is exquisite and seems to have escaped the shadows of its era. For half a millennium the tiny perfect Ming garden has been blooming in delicate shades of cobalt glaze. Winter always leaves everyone a bit down–especially considering that it has hardly begun and we have already been shellacked by numerous terrible snow storms. 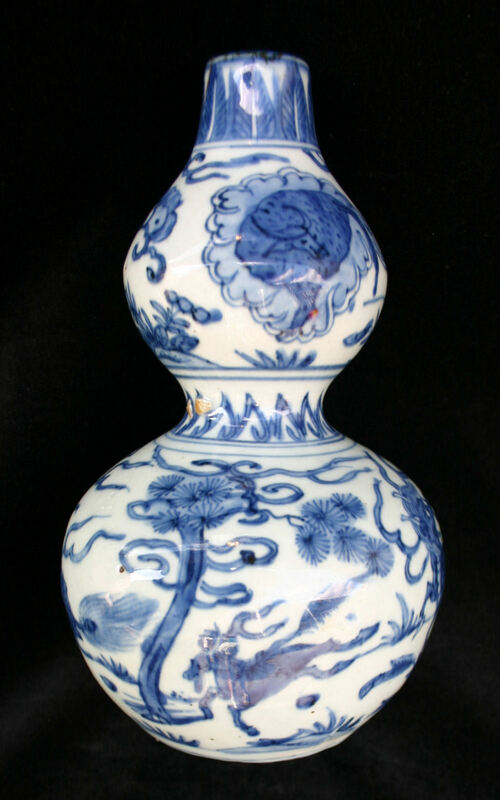 To raise everyone’s spirits, here is the photo of a lovely late Ming double gourd vase. For some reason the top of the vase features wallowing water buffalos, but there on the bottom globe of this tiny 16th century porcelain masterpiece is a leaping quilin—the legendary beast of heaven whose appearance presages good fortune. He is disporting himself among Chinese white pines and fire scrolls. I’m sorry I don’t have a better picture. The English merchants who were selling this piece didn’t quite photograph the Quilin in focus. However even in this blurry form, the graceful lines of the magic animal are evident and the artistry of the unknown creator is very apparent. Perhaps it was made on a bleak winter day half a millenium ago by some Jingdezhen potter who was dreaming of good fortune and summer in the mountains. Yesterday’s post concerning the Yuan dynasty was in preparation for today’s post about Yuan dynasty porcelain. 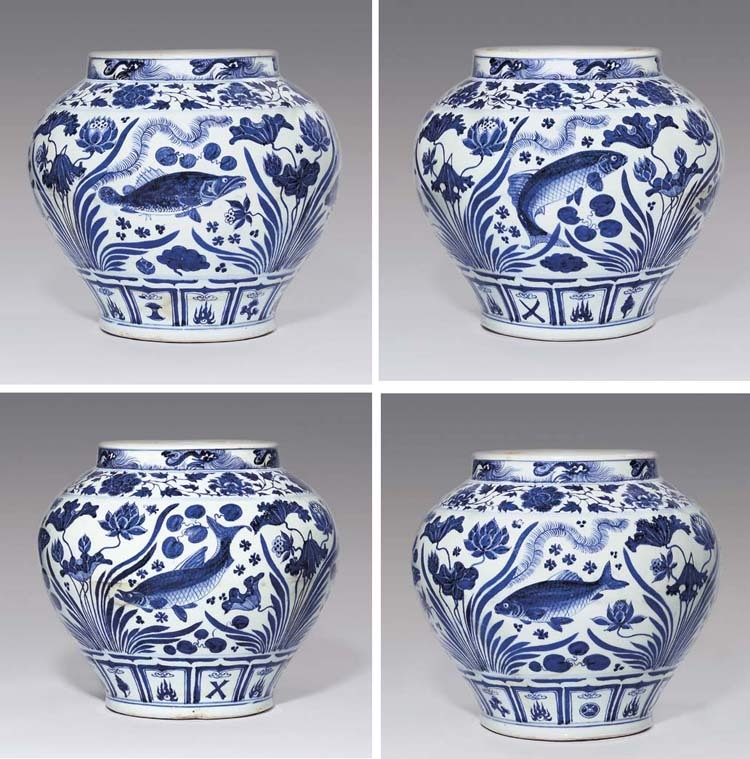 The blue and white cobalt porcelain which has become famously emblematic of Chinese ceramics (to such an extent that “China” became the name of the country and the product in England) was first manufactured in the Middle Kingdom during the Yuan dynasty. The blue and white vases and plates from the Yuan dynasty are more robust and bold then the famous Ming blue and white ware which succeeded them, but the lovely pure aestheticism of great Chinese porcelain is fully there. The best pieces feature a lovely syncretism of cultural motifs and forms which come together around a central symbol. The fish on the current jar provide a…complex rebus, since they appear to be qing black carp (mylopharyngodon piceus); (hongqi) bai predatory carp or redfin culter (culter erythropterus); lian silver carp (hypopthalmichthys molitrix); and gui or jue Chinese perch or mandarin fish (siniperca chuatsi). The names of these fish combine to provide rebuses which suggest either qing bai lian gui ‘of good descent, modest and honourable’ or qingbai lianjie ‘of honourable descent and incorruptible’. 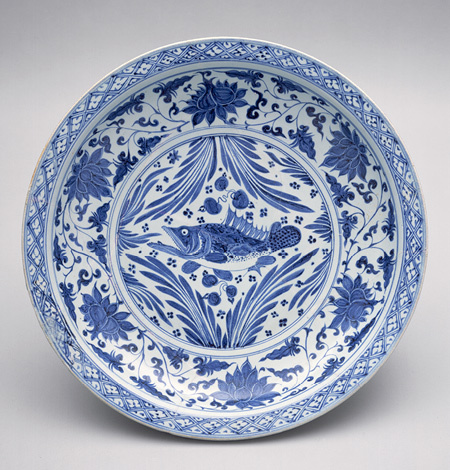 A fish, in this case a sea perch, is also the subject of this magnificent plate from the Metropolitan Museum of Art. The perch gapes open his mouth to leer at visitors from a bed of eelgrass. Around the central scene is a particularly vivid cavetto of lotus blossoms. 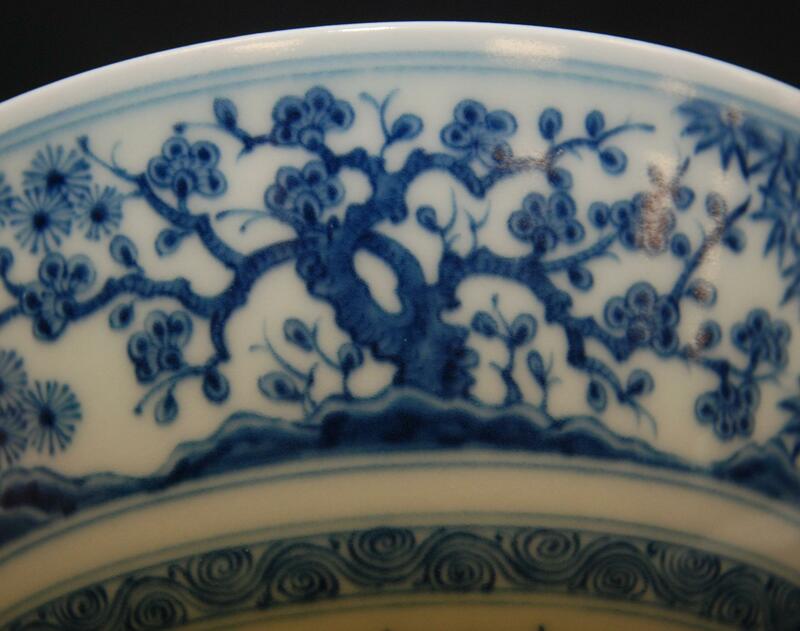 Archaeological discoveries indicate that the plate was manufactured at Jingdezhen in Jiangxi Province. Fish were a popular motif of Yuan porcelain because of a well-known Taoist maxim which compared people who had found their place in the flux of Tao to fish perfectly suited to living in their watery realm. The Han literati of the Yuan era had been displaced by Mongol elite and they frequently yearned for a more serene and central place in their world, an attitude quietly reflected by splendid aquatic porcelain. The final jar (also made in Jingdezhen in Jiangxi during the mid fourteenth century) shows not a fish but a vigorous fish-eating duck. His feathers are standing up in a fierce crest and he has a wild look in his eye. A pair of mandarin ducks is the ancient Chinese symbol for love, trust, and happiness in marriage–however this is not a pair of mandarin ducks but a carnivorous merganser hunting alone among the water weeds (although it seems there might be another one on the other side of the jar). It’s hard not to wonder whether this unusual duck unconsciously represents the Han’s unhappiness in their marriage to their fierce Mongol overlords.